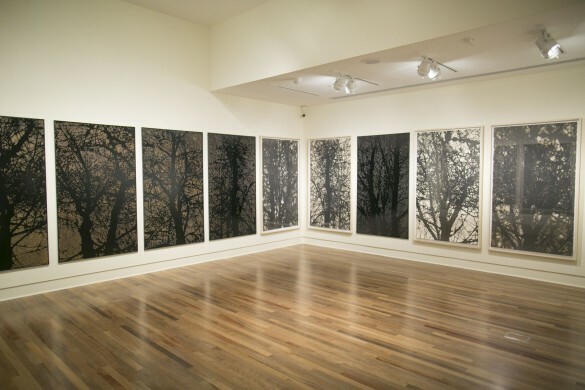 ­­­Master printmaker Charles Cohan is in the Arts of Hawai‘i Gallery doing a final walkthrough of his exhibition Ground: New Work by Charles Cohan, on view through March 25. It is just hours before the opening and he stands in front of a 40-by-70-inch slab of carved wood, its surface a black web of branches radiating out from two narrow trunks in the center, cutting through the warm gray and brown chiseled patterns that define the fractal shapes. “You can touch it,” he says with a smile. Then knocks loudly on the wood. Cohan is the 14th recipient of the Catharine E.B. 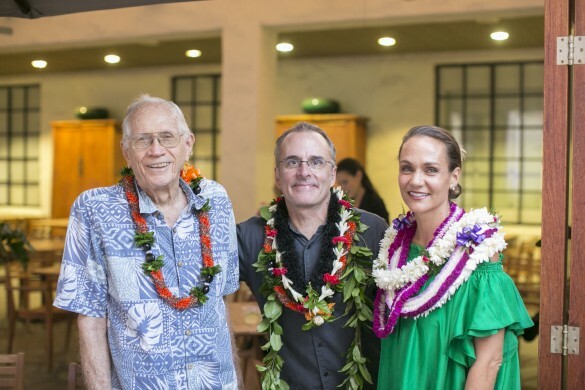 Cox Award for Excellence in Visual Arts—an accolade that is given every two years to a former or current Hawai‘i resident, and includes a one-person exhibition at the museum. The exhibition is spread across two subchambers of the gallery and comprises 11 carved woodblocks and 11 prints from Cohan’s Samish series, as well as the massive installation Converge II that is a collaboration with Maui-based printmaker Abigail Romanchak. Samish and Converge II are different projects, but both reflect a perception of what Cohan describes as “land movement, the fact that land is alive.” Each image captures a unique observation of these fluctuations, fixed forever in the artists’ memories. The 9-by-20-foot installation consists of 88 woodblock and collagraph prints featuring ghostly horizontal lines interspersed with jagged, frenetic waves, fading downward into dark grids. The two graphic styles are both representations of, well…ground. 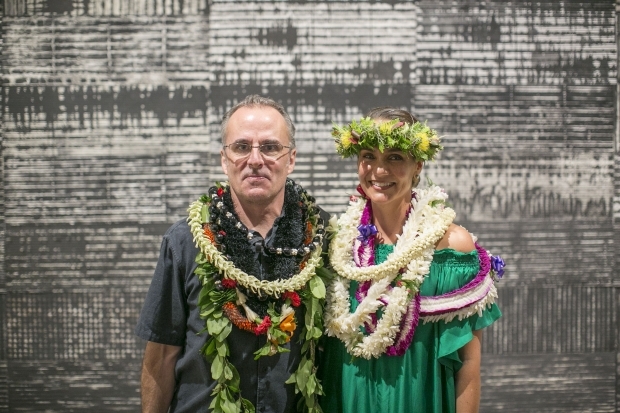 Romanchak’s prints are based on seismograph readings from Kīlauea volcano on Hawai‘i Island and Cohan’s are internal imaginings of the layers of sediment beneath his feet. Together, they form an intricate tapestry of technical and textural impressions of a subterranean landscape, at once both real and imagined. Cohan created each wood panel by tracing his photographs using an overhead projector and then carving them by hand with a chisel hand gouge. “In some of the images there’s more of a feeling that they’re alive—there’s evidence of growth,” he explains. “Others are really spare, there’s not a lot of lifeblood flowing in that one whereas this one feels like it’s living and breathing.” Cohan says the cherry trees “simultaneously expired” about a year ago and have since been cut down. At the opening reception for Ground, Cohan is showered with lei and greeted by a gaggle of current MFA students. Past Catharine E.B. Cox award winners Maya Portner (2015), John Koga (2012), Kaili Chun (2006), and Laura Smith (1994) stand by to congratulate him, along with other friends and colleagues. Cohan chats with Richard Cox who, with brothers Charles and Doak, established the award in 1985 to honor their grandmother Catharine E.B. Cox, who also happened to be the museum’s second director. Hear Cohan describe his process on HPR.